WHEN ALEXIS THOMPSON RECENTLY turned professional to play on the LPGA Tour at the age of 15, some questioned whether she was too young for the rigors of tour life and openly wondered about the potentially damaging attention she might receive. 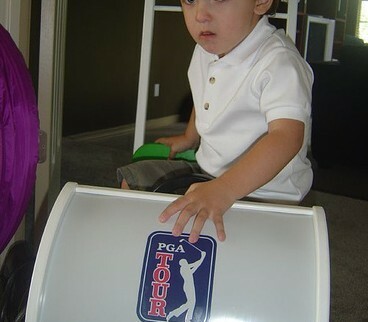 But Thompson is a grizzled veteran compared to a 3-year-old Arizona boy who may enter the PGA Tour’s Qualifying School this fall. The boy’s agent told ARMCHAIR GOLF in an email that his young client got an even earlier start in golf than Tiger Woods and other golf prodigies. The boy began making arm movements in his mother’s womb that simulated a golf swing and has aspired to play on the PGA Tour since he was 1. That was when he watched Woods beat Rocco Mediate in a 19-hole playoff to win the U.S. Open. Apparently, business opportunities are also available. Golf-related companies and mega brands are always on the lookout for the game’s newest star players. I have always said that kids should stay in pre-school rather than grab the quick money from endorsement deals (e.g. Huggies, Official Diaper of the PGA). Still, if he has the talent, he may find the local sandbox not big enough for his abilities. At that point, I say go for it. LMAO !! That's great ! I'll take 4 a side and kick the diaper off him. Make that 6.
bkuehn: I, too, have always been a proponent of staying in preschool, but I guess the times are changing. AG: Six is probably safer. That's what I would want.